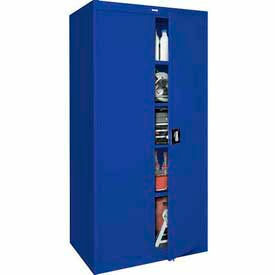 All-Welded Full Height Storage Cabinets Provide Tool Storage for Offices, Garages, and Other Warehouse Locations. 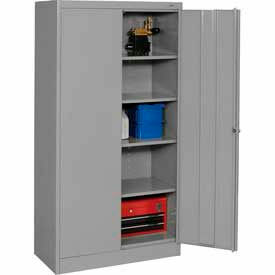 All-Welded Full Height Storage Cabinets are designed to store and organize spare equipment, tools, and other heavy duty materials. Dual doors swing on full-height piano hinges to accommodate full cabinet visibility and access. 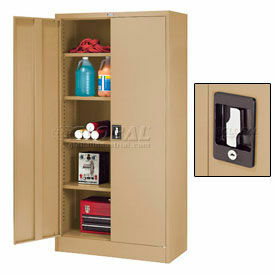 Storage cabinets feature a three point locking system for added security and protection. 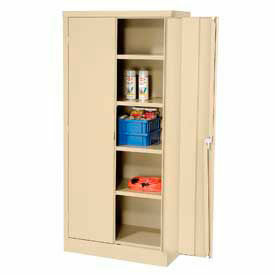 Select models include adjustable shelving to make space for larger sized items. Bright color finishes on some units provides high visibility. All-welded steel construction offers lasting durability. Dimensions vary per model.